Verizon MVNO Page Plus Cellular is now offering LTE. Although there's no mention of LTE on the Page Plus site, dealers are starting to get SIMs and the dealer portal has been allowing 4G activations since yesterday. Here's what you need to know to get started with LTE on Page Plus. A clean-ESN postpaid Verizon LTE phone. Clean ESN means not reported lost or stolen or with money owed to Verizon for the phone or for service. As far as I know there are no restrictions on the types of postpaid Verizon phones allowed. Contrary to earlier rumors the iPhone 6 and 6 Plus are OK.
For new activations and port ins, a $29.95 or higher Page Plus PIN is required at time of activation. LTE is only available with the $29.95 and higher plans. If you are upgrading a current Page Plus account to LTE, the account must be on a $29.95 or higher line before you can upgrade. At this time SIMs are in short supply. They have just started shipping and few dealers have them so far. Page Plus has not started selling SIMs to end users yet and isn't saying when they will. If you want to get going with Page Plus LTE as soon as possible your best option is calling local dealers. There's a dealer directory on the Page Plus site or you can do a Google or Bing search for Page Plus Cellular near 12345 (replace 12345 with your zipcode). It's a sellers market at this point, and most local dealers seem to be charging about $25 for a SIM. You may also have to pay an activation fee. The Page Plus dealer portal currently only supports online activations with a new number. Dealers have to call the dealer hotline to do a port in or to upgrade an existing Page Plus line to LTE. That makes port ins and upgrades a time consuming process and justifies charging a higher price for these services, especially upgrades which dealers do not get any commission from Page Plus for doing. Update 10/15: Dealers can now do LTE activations, port-ins and 3G to LTE updates on-line using the PagePlus dealer portal. If you do manage to get a SIM, Page Plus will activate it for you for free if you call them at (800) 550-2436 or use their online chat. Port ins and 3G to LTE upgrades are also free if done directly with Page Plus. Page Plus support hours are 8 AM to Midnight Eastern Time. Once Page Plus activates your SIM y0u just need to restart your phone to complete the activation. If you prefer ordering online, I've found a couple of dealers that are currently taking orders or pre-orders for SIM. Genius Wireless has mini/micro combo SIMs in stock for $9.95 with free shipping and expects to have nano SIMs soon. Activations, port-ins and 3G to LTE upgrades are FREE with a SIM purchase. Activations and port-ins are also free without a SIM purchase. Upgrades from 3G to LTE are $4.99 without a SIM purchase. Freedom Wireless has both sizes of SIMs in stock at bcfw.me/pageplus4g. SIMs are $10 plus $5 for Priority Mail shipping. Shipping is free if you purchase a $55 or 69.95 plan at same time as a SIM. Use the code 3OFF during checkout to get 3% off your order. Freedom Wireless is doing activations, port ins and upgrades for free using their own online chat for customers who purchase SIMs and airtime from them. PagePlusDirect.com has both sizes of SIMs in stock for $13.99 with free shipping. Activations and port ins are free and upgrading a line from 3G to LTE (an ESN change) is $11.99. Kitty Wireless has nano and mini/micro combo SIMs in stock for $25 with free shipping. Click here to order a SIM. LTE port-ins are $19.95 and come with a coupon good for 10% off the price of your second month of service. Kitty Wireless is not doing LTE activations or 3G to 4G upgrades at this time and recommends that customers call Page Plus at (800) 550-2436 for these services. Cellaholic Corporation (no website) 718-635-2020 or email [email protected]. SIMs are $5 with free shipping. Activation or 3G to LTE upgrade is $10 with SIM purchase, $15 without. * MMS data transport not included and reduces your data balance or is charged at overage rates if your data allowance is exhausted. 50$ pay go gigs is unreal, especially when throttled unlimited is the norm! Except that Page Plus' 1GB plan is $40 not $50 and no one offers unlimited throttled data on Verizon. I think the OP was referring to the overage rates ($0.05/MB = $50/GB). If so, this is still an apples to oranges comparison since PP overage would be at full speeds, but throttled unlimited is often at 128 kbps. Doesn't Red Pocket offer unlimited throttled data on Verizon? Even if so, I agree that it is not the "norm" on Verizon. Thanks Denise, do you know if these sim cards are interchangable like GSM phones? Yes, you can swap SIMs between LTE Verizon devices. Glad to see that one can us 4G phones. I hope that will continue to allow new activation of non-Verizon 3g phones for as long as Verzion sells 3G phones. However the value of Page Plus monthly plans ($39 and up) has been greatllydiminished by competitors offer unlimited data (soft cap throttled). If you don't nedd Verizon coverage, there values on GSM the both with providers and phone choices. On lousy networks for rural subscribers, Verizon can't be in many areas. A seller on Ebay wants $30 for a nano SIM. For that kind of money, I will stay with H2O! Be a little patient, grasshopper. Towards the end of October, the mania will die down and you'll be able to get SIM cards at a more nominal price. Early adaption, you play you pay. Some posts on HoFo are reporting some seriously throttled data speeds compared directly with VZW Post and Pre-Paid speeds. I saw a speed test posted on Facebook of someone getting 24 Mbps on Page Plus. That seems plenty fast. But I suspect that when the network is overloaded Verizon slows down speeds for prepaid and MVNO users to give postpaid customers better speeds. They will never admit that of course and it's impossible to prove definitively as so many factors can affect speeds. One user on FB compared to side by side tests on multiple devices, okay. I think I found the posts on HoFo you were referring to. User Viper32 is only getting 3.5 Mbps with multiple devices in multiple locations with a PagePlus SIM. That does sound like throttling. But other users are reporting higher speeds.There may be an issue with Viper32's account or SIM. I think it's too early to say conclusively that PagePlus LTE is throttled. I'm on Verizon Wireless prepaid Fastest LTE/XLTE network and I can tell you they don't throttle. You can look at my signature on Howard Forums under user name battmann. Also, whoever is claiming of getting 24Mbps on Page Plus can't be on Page Plus. Verizon Wireless isn't going to give the farm away for free. I have to go with Dennis' logic here, it is too early to tell whether or not throttling is occurring. We'll just have to wait and see what happens in a month or so. I'm holding off until some of the kinks are worked out. its sad they dont allow LTE on pay as you go plan. I hope this means Selectel will follow soon.. I chatted with Selectel this morning and I was told they will get it soon. Another replier was told by the end of the year, Selectel will have 4G lte. 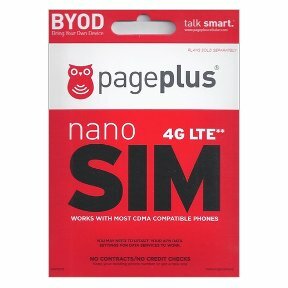 https://www.pageplusdirect.com/page-plus-4g-lte-sim-cards.html is $6.99 for either dual or nano. Thanks, I added PagePlusDirect to the post. I moved to post paid AT&T after Verizon wouldn't wouldn't respond to AT&T's $25 per smart phone discount on 10GB+ plans. With my company discount I'm paying $37 per phone with unlimited talk and text and all four of us share 10GB of data. I'll stay post paid as long as the prices are better. Proxy or not, Straight Talks real world speeds are the same (or faster in some cases) than AT&T post paid. I know, I was with AT&T cellular service since they first offered it in the middle 90's until 2013. I switched to Straight Talk a year and a half ago and I'm on my phone all the time and there is no difference in data speeds in real world use. In fact you can find youtube videos comparing Straight Talk and AT&T post paid data speeds side by side and Straight Talk coming out on top.. more than a few videos. Fact is MANY factors go into data speeds and speed tests are all but meaningless. Real world use is the only thing that counts, and people on post paid complain about getting "throttled" too. Sometimes data seems sluggish and sometimes it seems lighting fast, this holds true for both Straight Talk and AT&T post paid. This makes no sense. How could StraightTalk ever be faster than AT&T postpaid. Even if postpaid customers didn't get network priority (though they probably do), doesn't ST route data through a proxy server? If so, then under ideal conditions, ST will be as fast (but no faster) than postpaid. The link may not apply to Verizon wholesale customers (Page Plus). Does pageplus allow tethering? I read the terms and conditions twice and I didn't see anything about it. Unless I missed it twice. Page Plus terms don't prohibit tethering and hotspot use but Verizon phones block them from working. Rooting or jailbreaking and a custom hotspot app is required to hotspot and tethering to work. Competition rocks. Now that Verizon has decided to compete in a meaningful way in the prepaid market - you can look for the prices of those with lesser coverage to plummet. This is a great deal, and I will be looking at it as my family's phones age and need replacing. Might as well use the best if it is the same price. "As far as I know there are no restrictions on the types of Verizon phones allowed." The early information suggests that Verizon Prepaid 4G LTE phones are blocked from activation. So, does this mean an iPhone 5S from Straight Talk can be ported over to Page Plus if it's done before December of this year? What about Straight Talk disabling LTE internally in iPhone 5 series? How would one make use of LTE capable service on Page plus if this is true? Maybe later PagePlus will have FREE Roaming just like Verizon Pre Paid does. I also think its time for prepaid customers to get a fair treatment and stop being looked at as non important. I think in the long run the wireless companies will actually make more money from Prepaid customers in an economy where many postpaid customers could not afford to keep their contract due to surprise unexpected bills both from the wireless company or other unexpected household bills. Its safe to say you can't live in a cellphone and sometimes you get mortgage companies that just won't work with you and you have to sell everything but the kitchen sink to make ends meet. On of the pages at PagePlusDirect.com mentions the new activations foreign ESN s (ie flashed non-Verizon phones) being banned from Page Plus after October 5, 2014. Is this correct ? . Not true. I believe the ban on non-Verizon devices is not coming until December. Could it be that some PagePlus dealers just want to ban it early and only cater to the 4G phones by selling PagePlus SIM's and therefore making it easier for them since they no longer will be flashing? Plus to answer the roaming thing I do know that US Cellular prepaid does allow free 3G Roaming on voice and data as well as text. I was told soon (by the end of the yr that they will start allowing 4G roaming (in cities where its available). If this is the case it could be a very nice alternative although I don't know if US Cellular has their own network or are they a MVNO for Verizon (I know its not Spring because they have way better coverage in Elizabeth City, NC than sprint). Maybe Dennis can shed some light on that. Plus how come you don't have them as a prepaid option on your website although I think I read in your percentage that they have about 3% of the cellular market. Still it would be nice to see their phones talked about here and their plans for those who have access to them. U.S. Cellular has their own network. See Prepaid Operator Profile - U.S. Cellular for more information. As a SIM card Distributer, we are offering the PagePlus cards (dual cut or nano) for only $4.99 with free shipping! that port ins and upgrades should call PagePlus customer support for free assistance. Can an activated good PP sim card be put into a bad esn verizon phone ? I don't know but it seems unlikely as it would defeat the purpose of flagging ESNs as bad. Kitty Wireless is offering 50% off Page Plus SIMs.